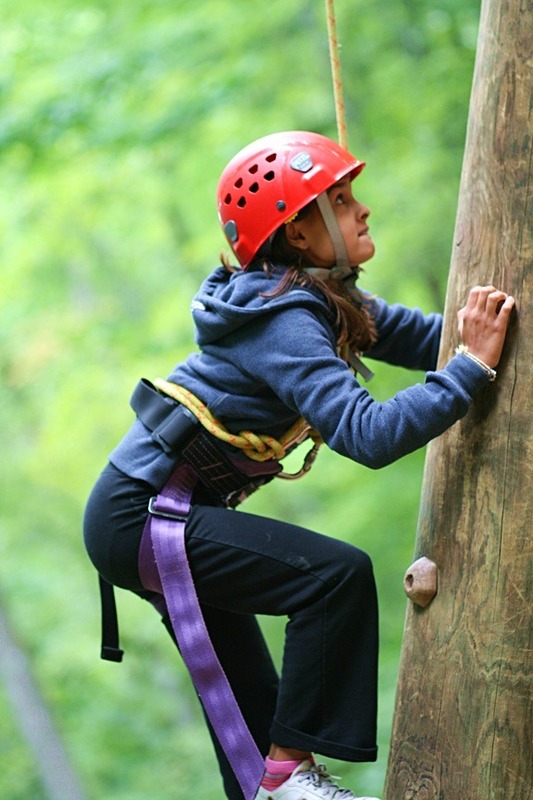 This is just a great outdoor adventure photo of a girl climbing the camp Alpine Tower high ropes course. 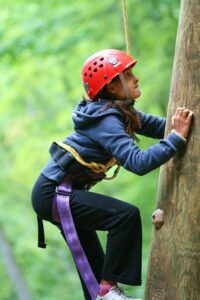 It shows her incredible concentration, her focused determination to climb well and reach the next hold. She’s also climbing with great form— balancing over her feet, space between her body and the pole, and downward pressure on her finger holds. You might think this sort of outdoor adventure activity is too freaky to enjoy, but once you do it, it’s cool how you can calmly make progress up the tower. Step by step, little by little, you find the next hold and stand up. It’s an exhilarating feeling to climb to the top. To concentrate like that and have it lead to a real tangible feeling of success— it’s almost addictive! It’s no surprise outdoor adventure keeps us all coming back. One Response to "We Love Outdoor Adventure"
Would the person who posted this picture be interested in using it for commercial interests? Like the Girl Scouts? If so, please contact me.